While designing and developing the game engine, it became somewhat necessary to start drawing some pictures to help get a bit of visualization going on. This picture here shows, hopefully, that the engine itself is merely a component in the "bigger picture" of how a bunch of code and logic fit together to finally and actually be able to make a real game product. Because the engine is C (read here for the reasons why it is C), the source code should be written such that we can take the C files over to platform x, compile it, and it just works. In theory that sounds great, but in practice it isn't quite that simple. As long as I can separate out the cross-platform code from the platform specific code, then all will be [mostly] well. Fortunately, this design also lends flexibility in how we go about implementing those platform specific things while allowing the vast majority of the engine to be compiled, more or less, as is across multiple platforms. The top part of the this picture shows the various Operating Systems we plan to support. 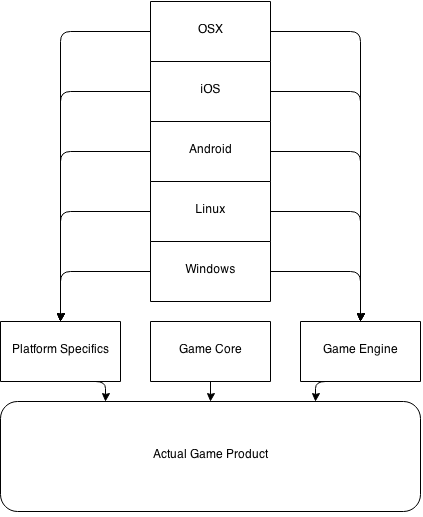 Each, of course, has their own considerations that don't play well with other OS's though -- so we had to split those "platform specifics" away from the "core" of the game engine. By decoupling them, we can make lots of upgrades, fixes, and what not to the core and have it be fixed instantly across all platforms. We can also write the platform specific parts once and never really need to change it once it works. Once all of these things are combined and compiled/linked together, the actual game can be spit out and run on any of the supported platforms! It is quite exciting to see our Windows version work near flawlessly on iOS or OSX just by pulling down the game core code, compiling, and it works... yea, sometimes there are hitches, but these are usually quick to fix as they are general oversights. It was also quite breath-taking to see a "windows game" work on Linux almost without a hitch also.